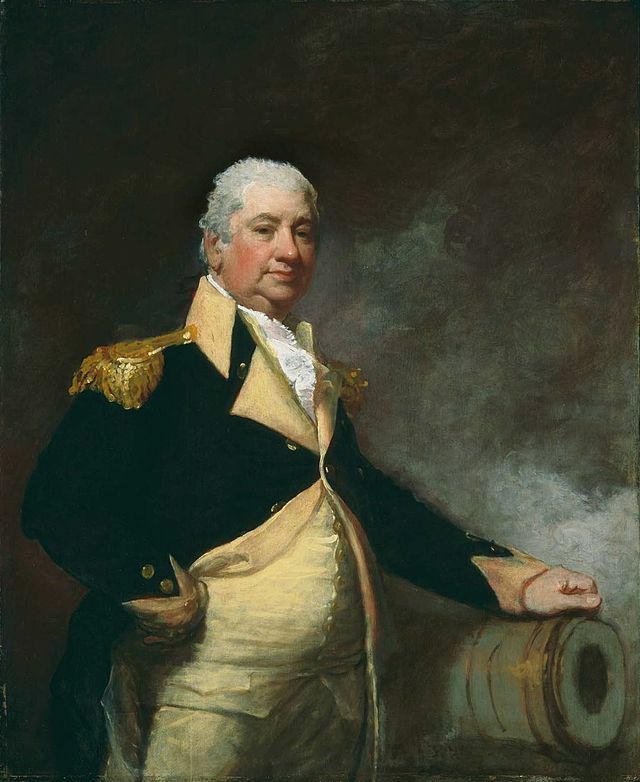 Henry Knox was born on 25 July 1750 in Boston, Massachusetts, to Scotch-Irish parents of humble origin. In 1762, Knox’s father, a shipbuilder by trade, died in the West Indies, leaving his wife and ten children without financial support. As result of his father’s death, Knox was soon forced to leave grammar school and seek employment as an apprentice bookseller. Over the next several years, he grew into a strong youth, standing over six feet tall and weighing around 250 pounds. As a young man, Knox possessed an inquisitive mind and developed a great interest in military affairs, especially in the uses of artillery. His enthusiasm compelled him to enlist in a local artillery company at the age of eighteen. Knox found himself in the midst of political tension in March 1770, when he reportedly attempted to dissuade British CPT Joseph Pierce from marching against Boston’s populace only moments before the Boston Massacre. At age twenty-one, Knox successfully opened his own bookstore specializing in military subjects. The shop quickly became a favorite destination for British officers posted in Boston. In 1772, Knox joined a new militia unit, the Boston Grenadier Corps. His leadership abilities, combined with his eager appetite for studying military science and engineering, won him the recognition of his superiors. Knox was granted the rank of first lieutenant, placing him second in command of the unit. Knox fell in love with Lucy Flucker, the daughter of a royalist, and married her against her father’s wishes in June 1774. The following spring, Knox and his wife, both staunch patriots, fled from Boston as revolutionary hostilities commenced. After presenting himself to MG Artemas Ward, Knox was assigned the task of constructing gun emplacements around Boston. GEN George Washington, newly appointed commander of the fledgling Continental Army, noted Knox’s talents as an artillerist while inspecting the fruits of his labor in July 1775. In November, Washington sanctioned a plan devised by the newly appointed COL Knox which called for the transportation of captured British artillery pieces from Fort Ticonderoga, New York, to Boston. Led by Knox, the expedition, consisting of hundreds of men and 100 teams of horses and oxen, hauled fifty-six cannon and mortars all the way to Cambridge, Massachusetts, by mid-January 1776. The newly acquired guns were then moved into position atop Dorchester Heights near Boston, forcing the British garrison to evacuate Boston in mid-March. After this impressive action, Knox became a trusted confidant to Washington. Knox participated in nearly every significant battle in the Revolutionary War. He crossed the Delaware River with Washington and brilliantly commanded the artillery at the ensuing Battle of Trenton. Washington, again impressed by his performance, recommended Knox’s promotion to brigadier general. He later participated in the Battles of Princeton, Brandywine, Germantown, and Monmouth. In 1780, Knox sat on the court-martial of MAJ John André, the British officer who had conspired with American BG Benedict Arnold to gain British control of West Point. Knox further contributed to the patriot cause by placing the artillery for Washington during the victorious siege of Yorktown, and soon after rose to the rank of major general. Retiring in 1796 to his mansion, known as Montpelier, with his wife in Thomaston, Massachusetts (now Maine), Knox became an active and respected member of his community. He provided many jobs, helped fund the construction of a church, and established a local militia. Knox died at Montpelier on 25 October 1806.